Translating Disqus from English to each of the countless languages of the publisher wishing to use it would be a daunting and impractical task. Transifex allows us to leverage the Disqus community to request, translate, and review different languages to make them available for selection in your Admin settings. Within the Disqus comment embed and admin panel, there are a total of 1,500 phrases, referred to as “strings” in Transifex, comprised of roughly 7,600 words. Translating these strings is required so that publishers can use Disqus in their language of choice. Currently, Disqus is available for use in 36 languages, meaning roughly 54,000 strings have been translated with the help of our community. Publishers who install Disqus and find that their language is not available can go to the Disqus project on Transifex to see if their language is listed there. When they find their language, they can see how many strings of words or terms have been translated/reviewed. 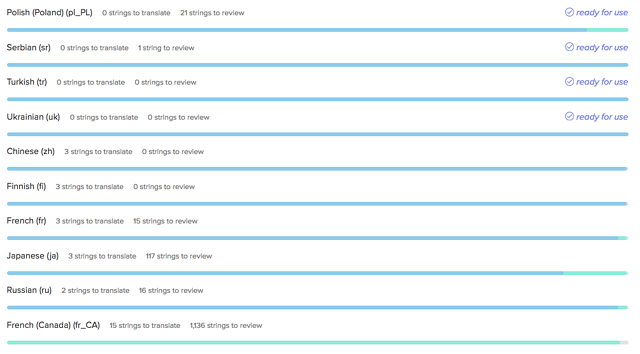 After a language is fully translated in Transifex, it then needs to be approved by Reviewers to ensure that the strings have been translated correctly. Typically, we require for languages to be at least 70% reviewed before they are available in your settings. Disqus translations are a community-powered effort. The community is always looking for passionate individuals who can help create and review translations, making the process even faster and more accurate. Since translations need to be reviewed before they are used on the platform, we require reviewers to verify the correctness of proposed translations, and ensure “bad words” do not get through. We typically recommend reviewers check in for new translations each week. Right now, some popular languages that are in need of translation/review are Spanish(Mexico), French(Canada), Czech, and Greek. With the help of our community, we hope to continue expanding Disqus to be accessible to more publishers and users from around the world.